Listening to Skid Road: Join us for a lunchtime panel discussion on the intersections of health, homelessness, and racism in King County, as well as explorations of the moral responsibilities of the University of Washington in addressing these issues. Hear from panelists who participated in the oral history collection for the Skid Road project, currently on display in the University of Washington Odegaard Library. Panelists include Krystal Koop, MSW; Nancy Amidei, MSW; Sinan Demirel, PhD; Rebekah Demirel (author of the memoir Nothing’s for Nothing: Transformation through Trauma) and Eric Seitz, RN; with Josephine Ensign (PI of the Skid Road project) as moderator. Special thanks to public historian Lorraine McConaghy, PhD for her support and mentorship throughout this project. This project was supported, in part, by an award from 4Culture. Additional support for the audio portion of the DS videos comes from Jack Straw Cultural Center. My Skid Road project was also funded, in part, by the University of Washington Simpson Center for the Humanities, the University of Washington College of Arts and Sciences, the National Endowment for the Humanities, and Humanities Washington. 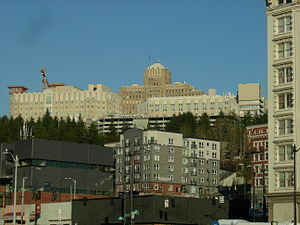 Harborview is the large King County hospital located on “Pill Hill” in the middle of Seattle. It is the only Level 1 Trauma Center for all of Washington, Alaska, Montana and Idaho. Harborview’s specific mission is to care for the county’s most vulnerable patients. As such, it forms the most visible part of the health care safety net for the Seattle area. I am always a bit awed by the scope of what they do, and have been able to see some of that firsthand this summer—from the high-tech trauma ICU to the low-tech/high touch Daryel /Somali Women’s Wellness Project. A useful Harborview resource I highly recommend is Ethnomed. Ethnomed is Harborview Medical Center‘s ethnic medicine website. The main purpose of Ethnomed is to help busy health care providers integrate cultural information into their clinical practice. While Ethnomed’s focus is on the main refugee and immigrant population groups currently coming to and residing in Seattle/King County, there is also general cross-cultural information that would be useful in any area. There are links to specific cultures, to different clinical topics, and links to printable patient education handouts in different languages including Spanish. On the main page there’s a link to sign-up for Ethnomed’s electronic newsletter.